Through the late 1970s and early 1980s, I had the honor of joining a special club. I was one of its youngest members. The Vitaphone - a movie theater owned by the husband and wife team Pat and Violet "Vi" Moore - was something of an anomaly, even for its time. I don't just credit the Moores for my experiences there - I also credit my dad for taking me. My love of film can be traced to his, and through my experiences at the Vitaphone. The Saratoga theater, with its distinctive red 'S' logo in the center of the two marquee signs, was built in 1948, out of one of the many World War 2 era quonset surplus huts all over the area. It was truly one of a kind. 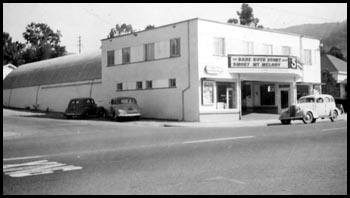 It wasn't until the 1970s that Pat Moore - an eccentric film enthusiastic and native of Santa Cruz, CA - came along and re-purposed the theater. His time in Hollywood as a grip and occasionally, a film extra, served him very well for the job. He had exclusive access to archival film that nobody else could get their hands on. He networked with Hollywood archivists and even Hollywood stars, and in doing so, gave his audiences access to films and newsreel footage, some of which had not been screened in decades. Pat was full of stories - for instance, he was an extra in John Huston's 1951 adaptation of The Red Badge of Courage. When the Moores first moved into the theater space, they christened it 'The Vitaphone,' after an old-time film audio synchronization process. At first, they had all kinds of problems with teenagers coming in and slashing the seats with pocket knives and other acts of vandalism. In response, the Moores did something really unusual (even by today's standards): they turned their theater into a private club. For just $10 a year, you were issued a special card making you a member, and the Moores reserved the right to refuse service to anybody. This could have backfired on them, but it didn't. It had the effect - largely due to the sorts of films they screened - of filtering through a respectful but enthusiastic crowd. In its time, although it only seated about 400, the Vitaphone in Saratoga acquired over 100,000 members - among them John Wayne, Charleton Heston, and Olivia de Haviland. And yes, those stars visited the theater. I could not have been more than four or five when I first visited the Vitaphone, but whenever I went to the movies, it was always on a Friday night, and always a very special time. The atmosphere in concessions was a lot like the lobby atmosphere at an opera, or a play. It was a community of film lovers. People mingled. They caught up. They grabbed free cookies and coffee. Each Wednesday, there was a potluck night, and members brought their own food. The auditorium itself was a long, domed structure. It looked cavernous to me back then. I recall the stucco design, and the murals depicting palm trees oasis and deserts - a kind of north African tableau. Faint light sources came up from a wall ledge on either side of the auditorium, and illuminated the illustrations, making them look like sacred cave paintings. There was a single aisle, and it sloped every so slightly down to a stage at the front. Seats on the right allowed you to light up while watching the film. As I sat in the dark of the hall, I lifted my eyes to watch the faint outlines of the trees and the desert vistas along the way. I saw curls of smoke swimming through the projector's ray over our heads. Every so often, from the corner of my eye, I saw something small and fast darting across the ledge below the murals. What everybody remembers are the memorable talks that Pat gave before each feature. His commentary was always specific to each film theme. He'd come out again between the two features and did something I won't soon forget. He took a can of cat food, and an electric can opener, and, placing them under the microphone, opened the can. Just then, those dark shapes we saw earlier, George, Georgina and Georgette, his cats, ran down either side of the wall ledges. He'd feed them and talk to us. We could hear their purring and their chop licking, loud and clear over the P.A. He'd even 'box' with his cats, down there on the stage. 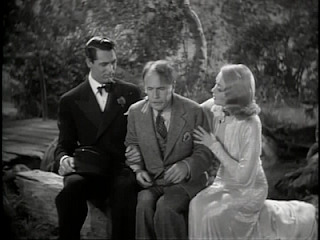 The format that the Moores adopted was that of the 'themed double feature.' They began the night by showing old newsreel footage, or film shorts like war bond commercials, and always at least one cartoon. This undoubtedly set the stage for the endless parade of film classics I saw there. Think of any classic movie, from the 1930s all the way up to the 60s, and chances are, it got shown at the Vitaphone. I remember seeing Laurel and Hardy shorts (and full lengths) for the first time. I saw 20,000 Leagues Under the Sea. Forbidden Planet. The Thin Man. North By Northwest. Topper. Ben-Hur. The Adventures of Robin Hood. That's only what I remember.After each movie, without fail, the lights came up, and Pat stood there, by the stage, and talked to us. I was too young to remember the subtext of the movies I watched, or the substance of Pat's many talks with the audience, but even at that age, I knew I was part of something special. My brief time with the Vitaphone shaped me. 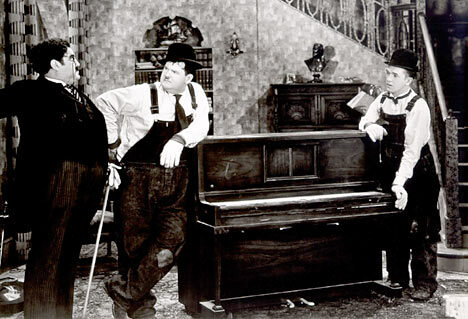 Theaters now (Palo Alto's Stanford Theater, Austin's Alamo Drafthouse and many, many others) keep the tradition going, but the Vitaphone wove a thread in me during a formative time, one that connected me with film in a profound way. Had I not been a part of it, my love of film might not have been so vast. The 1980s ushered in an era of blockbusters and theater chains. It got harder and harder to be a theater like the Vitaphone and remain viable. I recall seeing two movies there before the end - the Astronaut chronicle The Right Stuff and the weeper Somewhere In Time (both new releases at that time). I was still under ten years old. Soon afterward, the Moores' lease ran out and Saratoga's precious institution closed its doors. Pat Moore passed away in 1989, from complications due to lung exposure to film particulates. He got a full write up in the Mercury News lauding his contributions to film history and film education, but to this day, evidence of the Vitaphone's legacy remains scatter-shot, even on the internet. It doesn't even have a Wikipedia entry, not even a mention. That's sad. Just a few years ago, I hosted a few movie nights: two movies linked with a common theme. Unbelievably, when I began this tradition, I never consciously made the connection between what I was doing and my time at the Vitaphone. I see it clearly now. Sharing love of film, and doing it in a way that brings people together, is not just about satisfying demand. It's not just about getting bodies in seats. It should be about something greater than that. Sure, movie chains 'bring people together' in the most clinical sense, but creating a community through film? That is, for me, the Vitaphone's legacy, at least for me, and reason enough to keep it alive. Ah, such memories. I loved The Vitaphone and Pat and Vi. I spent a memorable summer working there (saw the chariot race from Ben-Hur every night for a week) and spent more happy Tuesday nights there for "Rare Film Night" and countless Friday and/or Saturday nights seeing the most beautiful prints of classic films I'd ever seen. 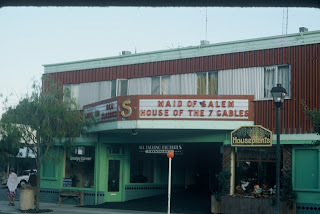 My first visit was to see The Adventures of Robin Hood on the big screen for the first time. I'd already seen it numerous times on TV 36 and 44, but, I swear my mouth gaped open for the first 10 minutes marveling in the joys and sheer stunning knockout beauty of seeing a 3 Strip Technicolor print for the first time. Thank you for bringing back such happy memories. I often wonder what happened to Pat's signed photo of Irene Dunne that hung in the lobby. Not only the cats but do not forget Pepperoni! Thank you so much for your marvelous comment. I wrote this recollection because I felt that the Vitaphone was such a special place and there is very little online recounting it's history. I humbly thank you for sharing your memories with us. P.S. 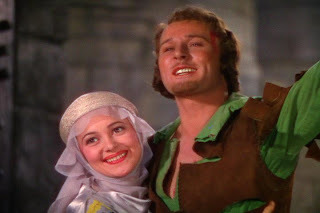 - I just bought the blu ray restoration of 'Adventures of Robin Hood' and while I look forward seeing it on my display, it pales in comparison to a properly presented 3 strip technicolor presentation. Oh I feel so sad as I went to the Vitaphone back when I was just a kid and grew up there. My dad loved old films and he took me to see King Kong. and I was hooked. We went every week and I became a movie nut. But it was the Moore family that made this place what it was. We went to the last day and its was a sad day. And I remember all the cute pets. I wanted to make a group on Facebook for the Vitaphone. I never did it but maybe its time.